Those of us outside Ireland, and in particular those of us in the United States, have a pressing and urgent responsibility to lend all the support we can to our brothers and sisters in Ireland who are resisting U.S. wars. Despite Ireland's officially neutral status and its claim to have not gone to war since its founding in 1922, Ireland allowed the United States to use Shannon Airport during the Gulf War and, as part of the so-called coalition of the willing, during the wars that began in 2001. Between 2002 and the present date, over 2.5 million U.S. troops have passed through Shannon Airport, along with many weapons, and CIA airplanes used to transfer prisoners to places of torture. Casement Aerodrome has also been used. And, despite not being a member of NATO, Ireland has sent troops to participate in the illegal war on Afghanistan. The people of Ireland have a strong tradition of resisting imperialism, dating back even before the 1916 revolution of which this year is the centenary, and they aspire to representative or democratic government. In a 2007 poll, by 58% to 19% they opposed allowing the U.S. military to use Shannon Airport. In a 2013 poll, over 75% supported neutrality. In 2011, a new government of Ireland announced that it would support neutrality, but it did not. Instead it has continued to allow the U.S. military to keep planes and personnel at Shannon Airport, and to bring troops and weapons through on a regular basis, including over 20,000 troops already this year. The United States military has no need for Shannon Airport. Its planes could reach other destinations without running out of fuel. One of the purposes of regularly using Shannon Airport, perhaps the main purpose, is very likely simply to keep Ireland within the coalition of the killing. On U.S. television, announcers thank "the troops" for watching this or that major sporting event from 175 countries. The U.S. military and its profiteers would hardly notice if that number dropped to 174, but their goal, perhaps their main purpose and driving objective, is to increase that number to 200. Total global dominance is the explicitly stated objective of the U.S. military. Once a nation is added to the list, all steps will be taken, by the State Department, by the military, by the CIA, and by any possible collaborators, to keep that nation on the list. 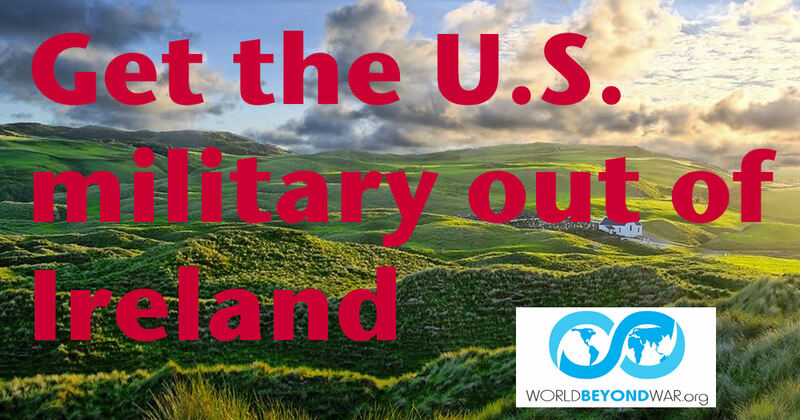 The United States government fears an Ireland free of U.S. militarism more than we probably can imagine. The global peace movement should desire it more than we probably do, including for the example it would set to Scotland, Wales, England, and the rest of the world. How do we, outside of Ireland, know anything at all about what the U.S. military does in Ireland? We certainly don't learn it from the U.S. government or U.S. journalism. And the Irish government takes no active steps to reveal what it knows, which is likely not everything. We know what we know because of brave and dedicated peace activists in Ireland, representing majority opinion, upholding the rule of law, exercising creative nonviolence, and working through numerous organizations, most prominently Shannonwatch.org. These heroes have pried loose information, elected and lobbied members of the Irish legislature, entered the grounds of Shannon Airport to ask question and draw attention and face criminal prosecution for the cause of peace. If not for them, citizens of the United States -- a nation that literally bombs other countries in the name of democracy -- would have no idea what was happening whatsoever. Even now, most people in the United States have no idea. We have to help tell them. Even U.S. supporters of war don't support a mandatory draft, at least not until they themselves are too old to qualify. Many should be willing to oppose forcing Ireland to take part in wars it wants no part in. If U.S. military transport continues to make use of Shannon Airport, a disaster will inevitably occur there. Of course the moral disaster of participating in the mass killing of people in Afghanistan, Iraq, Syria, etc., is ongoing. The cultural disaster of insidiously creating the impression that war is normal is underway. The financial cost to Ireland, the environmental and noise pollution, the heightened "security" that erodes civil liberties: all of those things are part of the package, along with the racism that finds a target in the refugees fleeing the wars. But if Shannon Airport survives routine U.S. military use without a major accident, spill, explosion, crash, or mass-killing, it will be the first. The U.S. military has poisoned and polluted some of the most beautiful spots in the United States and around the world. The unsurpassed beauty of Ireland is not immune. And then there is the blowback. By participating in counterproductive wars that generate international terrorism, Ireland makes itself a target. When Spain became a target it pulled out of the war on Iraq, making itself safer. When Britain and France became targets, they doubled down on their own participation in terrorism-too-large-to-carry-that-name, generating more blowback and deepening the vicious cycle of violence. Which path would Ireland choose? We cannot know. But we do know that it would be wisest for Ireland to pull out of its criminal participation in the barbaric institution of war before the war comes home. Remove all U.S. troops and weapons from Ireland and from use of Irish airports.